Website design field is ever-growing and constantly changing. What design element was once considered to be the soul of a website becomes obsolete in a matter of few days. Sometimes these trends are launched due to the necessity such as responsive device, while others are simply industry shifts such as the transformation of flat design to modular design. The decision of implementing these trends should depend on the requirements of your business and your target audience, and should not be simply based on “what other popular sites are implementing”. As a matter of fact, if a website design trend quickly becomes outdated, how your website supposes to last a lifetime with the same trend. Having said that, there are certain website design trends that you should be extremely careful about. Have an up and running WordPress powered website? If so, then it’s security should be of utmost priority for you. WordPress is extremely vulnerable to security threats and attacks because of its growing popularity. There are numerous fans of WordPress simply because it is an extensive, effective and powerful platform that powers more than 23.7% of websites today. However, any platform that integrates third-party software carries risk along due to third-party vulnerabilities. Fortunately, with the support from a huge support community, WordPress has many plugins and strategies to protect your website from hackers. We have compiled a list of essential plugins and ways to harden your WordPress website security. As the world gets more and more mobile with each passing day it’s important to realize more of your visitors will be visiting your website on their mobile devices. That’s why within the last year Responsive WordPress themes have become hugely popular. Responsive WordPress themes are ones where the layout expands or contracts to fit the viewers screen no matter if they’re on a 30″ monitor or a tiny 3 inch iPhone screen. 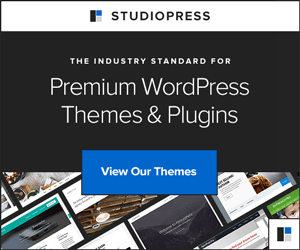 It seems like just last year fullscreen WordPress themes just started to capture some momentum within the theme development community and now…well you can see that there was clearly a demand for them. Fullscreen or full bleed WordPress themes empower photographers and creatives to display their photos in a bold manner. It’s no wonder they have become so wildly popular over the last 18 months it seems. I’ve been working with WordPress for more than two years now and it’s hard to remember how it felt when I just got started. I do know that it’s important to have some sort of guide to learn the basics and get acquainted with somthing new. WordPress is rapidly gaining popularity… even more than before. Introducing the free “Tumble Ten” theme. Tumble Ten is a modified version of the default Twenty Ten theme with a more Tumblresque style created for use with the new Woo tumblog plugin. This can also be used without the plugin if you just want the look for your own blog. Google Analytics makes it easy for you to track and keep tabs on the who, what, when, where, how and why of your blog’s readers. This 4.5 minute video talks you through setting up Analytics for your self-installed WordPress blog. If you are currently using WordPress for iOS or are one of the disappointed users who tried it and immediately deleted the old thing within 5 minutes…you have to check out the latest version to hit the App store. I have already downloaded the app and have to say it’s a big improvement from the dinosaur that came before. It’s a whole new WordPress for a whole new platform. WordPress for iOS, version 2.6, is now optimized to take advantage of the iPad’s new user interface, making blogging from your device even easier than ever before. Download it from the App Store today or read more about it on the WordPress for iOS website. Devin Price from WPTheming.com shows you how to enable wordpress 3.0 multisite. In this tutorial he will switch a standard WordPress installation over to the multisite version so you can use multiple blogs from one installation. Now that WordPress 3.0 is out here is a quick tutorial on how to add custom navigation to your themes. The new custom navigation feature in WordPress 3.0 has to be my absolute favorite. This gives you the ability to add items like custom links, pages, and categories. The drag and drop interface makes it extremely simple to use. This feature will not be available in older themes unless the theme author updates that theme. In this article, we will show you how you can enable and install custom navigation menus in your themes. If you’d like to change which of the authors on your blog is given attribution for a specific post, this video will show you how. In this screencast, Tom Johnson of Id Rather be Writing explains how to style category levels in WordPress so that each category level (parent, child, sub-child) will have a distinct style. You style the categories by adding specific classes to your stylesheet. This handy dashboard widget allows you to monitor your server directly on the WordPress dashboard. Simply copy the code below and paste in your functions.php file. For this to work you also must set the value of the $logfile variable at the start to the absolute server path of your log file. At WP Switch we really like comic books. The level of creativity and talent these artists possess is simply amazing. Here are 20 of the most inspiring and creative comic book drawings I have found this month. With each one having it own style and unique use of color you are sure to get a dose of inspiration for your next design. Lumin is a sleek and professional portfolio theme built in a CMS style. This allows you to have a page-based layout, while still maintaining separate post-driven Blog and Gallery sections. The Blog and Gallery sections have been customized with unique post styles that deliver content in a more functional manner. Here is a collection of my favorite free WordPress themes released in December of 2009. The long awaited WordPress 2.9 is finally here. You can upgrade easily from your Dashboard by going to Tools > Upgrade, or you can download from WordPress.org. A few of the kickass new features are outlined in the video below.